For me Joy is an attitude—it is not happiness though it may feel like it. Happiness is fleeting, like sadness or silliness or worry. Joy is a gladness inside you that exists regardless of the good or bad things that happen during your day. Like Love, it is a Verb. It can feel like very hard work on some days because in order to gain JOY I have to take my monkey hand out of the cookie jar and let go. It means I fix my focus on a good greater than myself, my surroundings or my experience. I have discovered on this very adventurous and rocky path called life, JOY is the key to open the door to the CORE VALUES in my life. JOY creates a peace inside of me even when chaos surrounds my moments. Regardless what I walk through—the yuck, muck and stink of a situation—I fix my focus on God’s purpose for the events in my life rather than the circumstances surrounding me. Supportive care of the people I love is not easy, I stand in the gap to solve problems listening to some good, but usually bad or ugly looking for counsel. Joy does not remove my emotions nor does it stop bad things from happening daily. 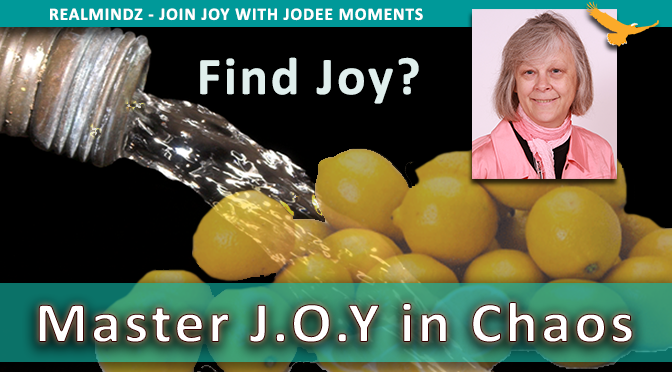 Joy allows me to STEP BACK – REFLECT – REFRAME. It separates me from the chaos of the moment and gives me small spaces in my mind and heart to work through life’s happenings and get done what needs to be done. It helps me organize the lemons dumped by the truckload at my doorstep. I remember one summer day, long ago as a neighbor kid ran into my kitchen with a flowing water hose chasing the kid, I had just loudly to “Walk” as he flew by me and out the other door…and turned to scream I screamed, “Out now!” just as the length of the hose stopped. The kids know when I close my eyes I a thinking and they will be accountable. I closed my eyes for a moment, put a smile on my face and took a deep breath, then I reached for mops, buckets and sponges to distribute to my new cleaning crew. I admit sometimes you REACT – but even when you have reacted you can STEP BACK – REFLECT – REFRAME. The mess could have ended in anger or joy. It was my choice. I chose a sparkling clean kitchen. I question myself in troubling times – is my emotional being relying on my circumstances? If so, I take a check up from my neck up! Join together with Holy Spirit to embrace the fruits of the spirit. Open your heart and shut off the voices in your mind that bring you down. Access your circumstances – look with realism – reflect – reframe – let go. The supernatural presence of Joy gives me Hope and Perseverance through my darkest moments. How did I first achieve Joy? The first time I felt real JOY came after I requested the Spirit of Holiness to enter my life. I had read about the nine fruits of the Spirit and I was at a very dark place. I did not have the personal strength to carry on. The light of my very being was be snuffed out. I felt suffocated by all that was being required of me and personally life was not fun any more. With nothing left to give, I let go and asked God to move me to a new place. I didn’t move physically, I still had the same family and same financial issues and same health issues, but I had a different attitude and more importantly I had the power to change me. This entry was posted in CALM, CHERISH, CONNECT, CORE VALUES, Jodee Kulp and tagged autism, children of trauma, FASD, PTSD, trauma, wisdom.